Gwyn Lloyd Spinther James was born in May 1904 and educated in Llandudno, where staff at John Bright School described him as “an outstanding pupil”. At the University of Wales, Bangor, Gwyn attained a First Class science degree before joining the army with the rank of second lieutenant on his 20th birthday. In the Royal Artillery he specialised in bomb technology. For three years before the outbreak of the Second World War, Gwyn was a senior ballistics officer at the regiment’s “Experimental Establishment” in Shoeburyness, Essex. 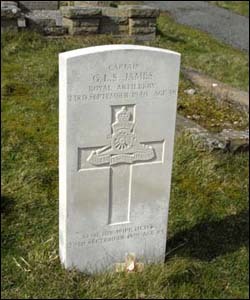 Captain James was killed, aged 36, in September 1940 while “undertaking specialist work of considerable importance”. He was buried with full military honours – his body being carried on a gun carriage draped with the Union flag. He had been living in Craig-y-Don with his wife Olive and two children. His grandfather, Rev Spinther James, was Pastor at Glanwydden Chapel, near Llandudno, for 20 years. The Rev James wrote historical books, including a four-volume history of Welsh Baptism. Soon after the First World War began, he strode onto Llandudno's football pitch and told the players that if they were "fit enough to play football, they were fit enough to fight".